Stephen Davies provides further information about the history of Waglan Island lighthouse, its link to another in NE China and to two European companies. And a Swede who was awarded the Nobel prize for Physics for his invention regarding the illumination of lighthouses. 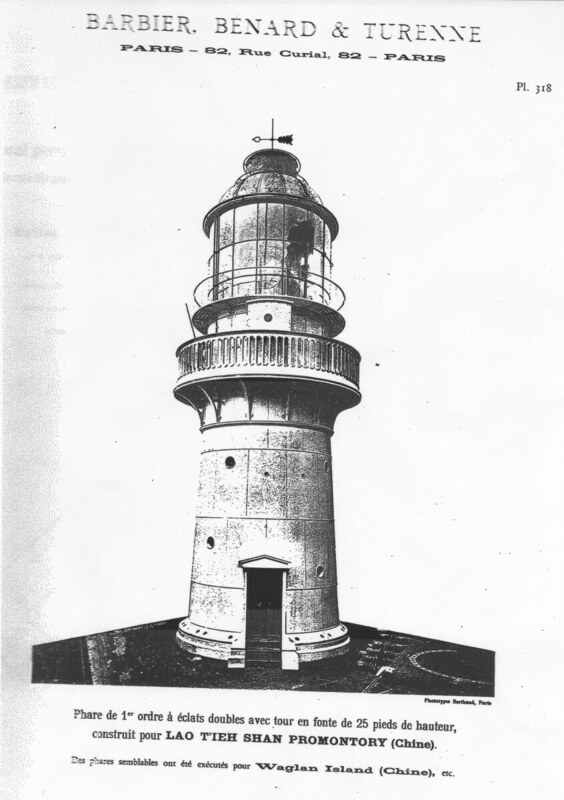 SD: The light was built by Paris lighthouse makers Barbier, Bénard & Turenne as one of two identical lights for the Chinese Maritime Customs Marine Department. 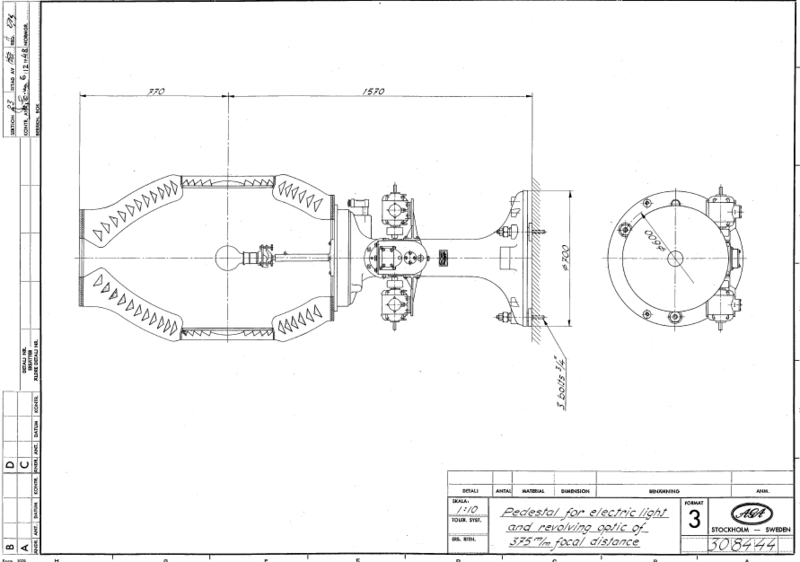 Both were some of the first lights in the world (if not the first) to use BB&T’s new mercury bath rotating lens – an almost friction free bearing for the lens apparatus, that enabled an 8 tonne first order lens to be rotated by the push of a little finger. Both lights had magnificent first order Fresnel lenses. Waglan’s twin sister, the Laotieshan Light, is on the tip of the Liaodong Peninsula, NE China, and, at least until recently and unlike Waglan, had its original BB&T lens (good pictures on Panoramio). Both lights were installed in the same year, 1893. They were constructed of cast iron, disassembled and shipped out for reassembly in their chosen locations. 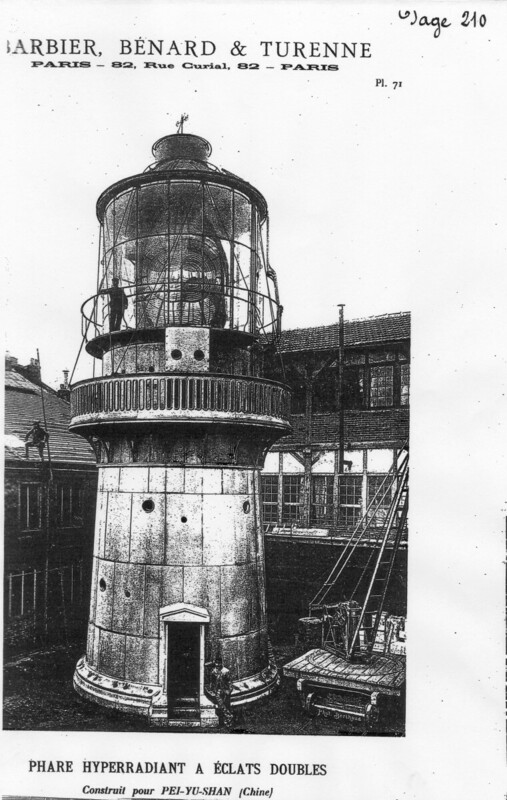 The picture below shows a lighthouse assembled in the Paris B, B&T factory yard, to make sure the kit was complete, before being dismantled and crated. Come the Japanese invasion in 1941, as far as I know, the original lens was broken up and thrown down the cliff into the water and the lighthouse machinery put out of commission. In Tony Banham’s exhaustive campaign narration (linked below), the keeper and his eight staff were evacuated at 1030hrs on 13th December by APV (Auxiliary Patrol Vessel) Frosty Moller and taken to Aberdeen. Whether the Japanese put the light back in commission I don’t know – it seems unlikely, though I am sure they garrisoned the rock as a lookout and maybe fortified it (they certainly turned Tathong Point light into a gun emplacement). After WW2, according to the data in the Swedish archives, organising a replacement from the famous AGA company (a pioneer in lighthouse lamp technology) took a time. This was because the authority through whom negotiations opened, I think as a result of the military government 1945-46, was India, and when India gained independence in 1947, there was mild chaos whilst lines of communication were re-established. 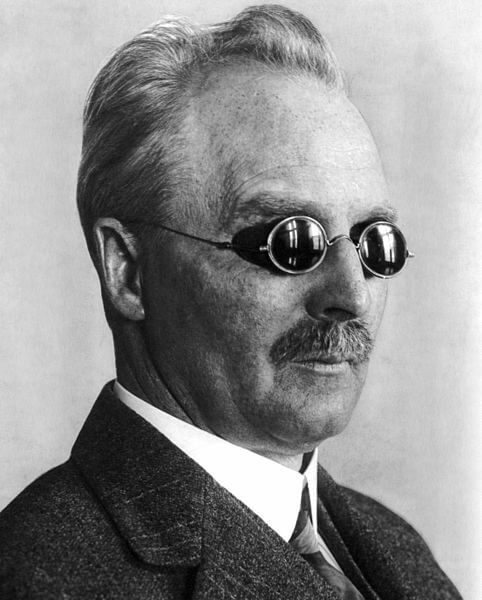 Gustaf Dalén, who became managing director of AGA when it was founded in 1909, produced the world’s first automatic sun valve for switching on and shutting off lights (an old HK one still exists at the foot of the stairs to the HK Hydrographic Office at Stonecutters Island). The new light finally got going in 1951. That’s why from late 1945 until 1951 Waglan’s characteristic (unique light signature) was flashing once every 6 seconds, only reverting to the pre-war (and original) 2 flashes every 30 seconds with the new apparatus in 1951 (it now 2 flashes every 20 secs). The light was refurbished in 1972 by AGA UK (which became Pharos Marine in 1985), given a new, multi-sealed beam array light in 1989 when the light was automated. Waglan was always not just a lighthouse but a signal and reporting station (linked by telegraph to HK), a radio direction beacon (radio lighthouse, as it were – equipment installed post-war), later an RN radar station and used for RAF air traffic control, and of course a fog signal as well, in later years, as a weather observatory. The signal/reporting station role was an essential part of maritime safety for the light’s first couple of decades before radio became compulsory on ships post-1912 (and the Titanic disaster) and it remained a key role until after WW2. The fog signal was originally a gun – the signal was two guns fired in quick succession on hearing a ship’s fog signal, but in c.1922 these were replaced by a diaphone (a two tone beast that sounds like a dying cow), although a gun still served as a back-up. Interestingly the diaphone fog signal was got back into working order much quicker post-war than the light and was listed as with the same characteristics as pre-war as early as 1949. Exactly when the diaphone was replaced I don’t know. It was still working in the late ‘90s, but when last I heard Waglan’s fog signal a few months back, it has now been replaced by a rather pathetic horn. This article was first posted on 19th February 2015.